Documents posted by Heritage Victoria say the approval exempts all construction work associated with the $6.8 billion tunnel from requiring a permit, including digging the tunnel using deep “cut and cover” techniques and creating a tunnel portal. The exemptions cover the removal of trees and vegetation, the grade separation of the Upfield railway line and construction of viaducts, feeder roads, footbridges, shed, buildings and a carpark. Road opponents said Mr Guy had ignored legal advice sought by the Heritage Council that suggested only work that did not “materially affect” the heritage significance could be exempt. Landscape architects Ronald Jones and Bruce Echberg nominated Royal Park for heritage protection last year in a bid to stop the tunnel. Mr Jones said the recognition of the 150-year-old public park created by Charles La Trobe was “long overdue”, but exempting East West Link was an abuse of process. “It obviously trivialises the listing if the single largest imaginable threat to the integrity of a heritage place is allowed to proceed as an integral part of the listing process,” he said. 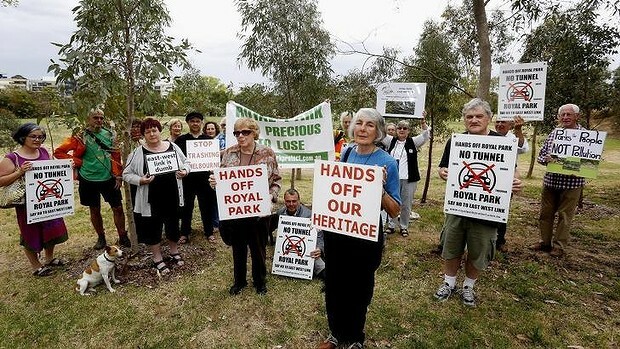 Two community groups Protectors of Public Lands Victoria (PPLV) and the Royal Park Protection Group said they were seeking legal advice to prepare a new Supreme Court challenge. Mr Guy defended the decision, saying he had considered the Heritage Council’s independent report and the potential impacts of East West Link. “The executive director of Heritage Victoria recommended a number of permit exemptions to ensure recreational and sporting uses can continue to be accommodated without requiring permits,” he said. “I have also exempted works for East West Link, after fully considering potential impacts on the heritage significance of the site. Requiring remediation and reinstatement of parkland after East West Link construction will ensure that the park’s heritage values are protected,” he said. Former Labor advisor Andrew Herington, who is advising the tunnel’s opponents, said Mr Guy’s decision was “flawed”. “Advice from Susan Brennan, QC, that the Heritage Council provided to the minister made it very clear that the exemptions only applied to minor works,” he said.